BGO Casino is an online casino that has made the name for itself by breaking away with the tradition and taking a different approach to rewarding players. Doing away with the traditional bonus system, they came up with a concept of „Fair Spins,“ and these do seem to be much simpler for the players to understand and use. BGO is one of the top choice for New Zealand players as their library of pokies is quite extensive, the gaming platform is nice and clean, and their bonuses are solid and straightforward. To get their welcome bonus at BGO Casino, New Zealand players don’t need to know a special BGO Casino bonus code or anything of the sort. The casino features a very simple system, where your reward will be issued immediately after a successful deposit of NZD10 or more. As mentioned, BGO doesn’t offer traditional bonuses, but rather sticks to the Fair Spins concept. Players are awarded one Free Spins for every NZD deposited, so the minimum you can get is 10. 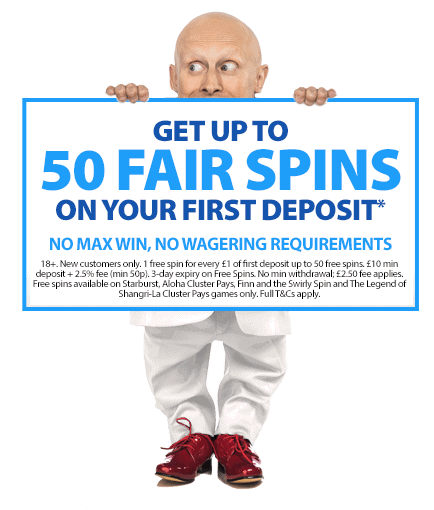 The maximum amount of Fair Spins issued as the part of the welcome package is 50. The best part about BGO Fair Spins is the fact that any winnings you get are completely free of wagering and yours to do with as you like. Spins can be used on several pokies, such as Starburst, Aloha Cluster Pays, The Legend of Shangri-La, and Finn and the Swirly Spin. This bonus is really as simple as it sounds, with no special BGO Casino coupon code to worry about and no wagering requirements to restrict you. Get up to 50 free spins, use them on one of the available slots, and whatever winnings you get are yours to keep, just as if you were playing with your own money.